The concert got off to a late start, delayed almost an hour-and-a-half as fans waited in long lines to pass through metal detectors and super tight security cordons.But the mood was upbeat and Beatlemania was in full swing in the square outside the Hermitage Museum. Lucky ticketholders waved Beatle memorabilia and proudly wore their Beatles' T-shirts. Russia's train system added extra train service to take fans from Moscow to St. Petersburg for the show. "I grew up with this music," said Igor Malsky, a journalist who said he has been a Beatles fan for four decades. "When I first heard their music, I knew right away it was mine." The event, reportedly McCartney's 3,000th gig but his first ever in St. Petersburg, came on the peak of the northern city's famous White Nights, when the sun barely dips beyond the horizon before starting its upward climb again. But Sunday's weather was rainy and clouds hid the sun. Tickets reportedly cost from about $20 to $1,720 for special VIP-seating, where President Vladimir Putin was expected to catch at least some of the show, according to Russia's Izvestia newspaper. The Beatles were officially banned by Soviet authorities, who declared their music a corrupting influence of the West. Malsky recalled a school friend being punished for listening to the Beatles. Young people had to listen surreptitiously to "Let It Be," "Yesterday," and "Imagine." Yet Beatlemania in the Soviet Union was as strong if not stronger than anywhere else in the world perhaps because it was forbidden fruit. 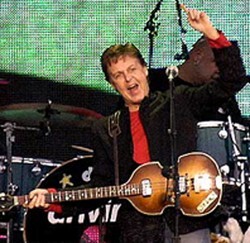 Last year, McCartney fulfilled what he said was his longtime wish and performed in Moscow's Red Square before about 20,000 fans, including Putin. He delighted the crowd with a rousing rendition of "Back in the U.S.S.R."
City news archive for 21 June' 2004. City news archive for June' 2004.